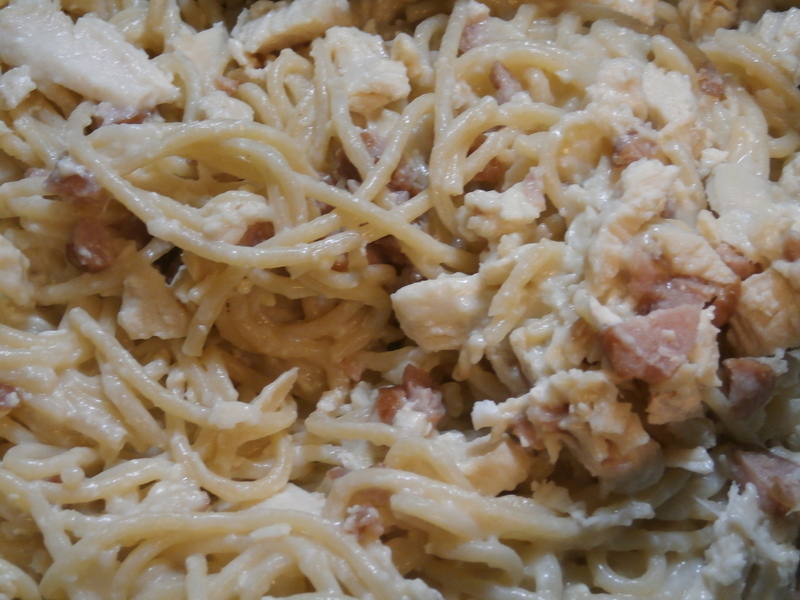 Our family loves a good, hearty Italian dish, and this is a modified form of the delicious Spaghetti Carbonara I came up with based on whatever leftovers we had on hand this week. 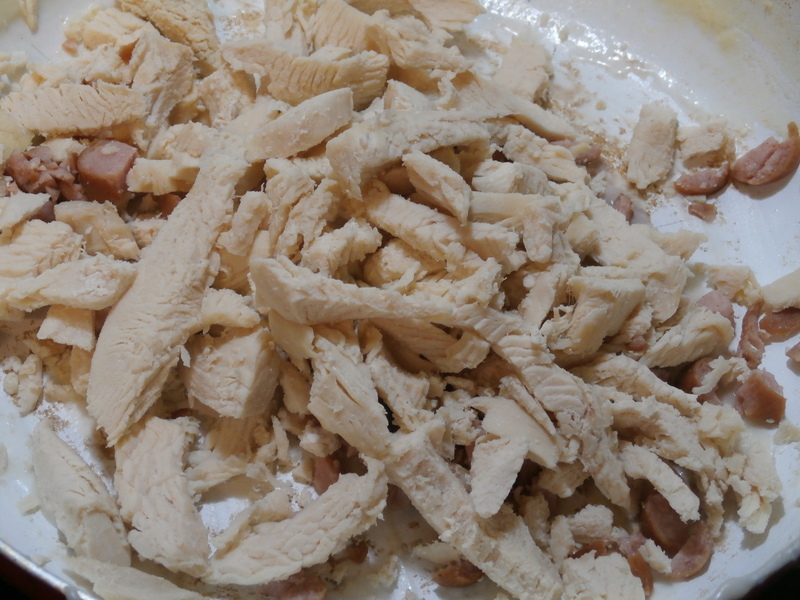 Because we’re big on eating protein in our foods, I added in some cooked chopped chicken (2 breasts boiled and chopped) I had done earlier in the day, the traditional recipe only uses chopped pancetta (a pork product very similar to bacon). We never typically have real bacon or pork products on hand, however we use different kinds of sausage to flavor meals fairly regularly, and this was the perfect time to use some beef sausage to capture that intense, aromatic and spicy flavor to go with the sauce. 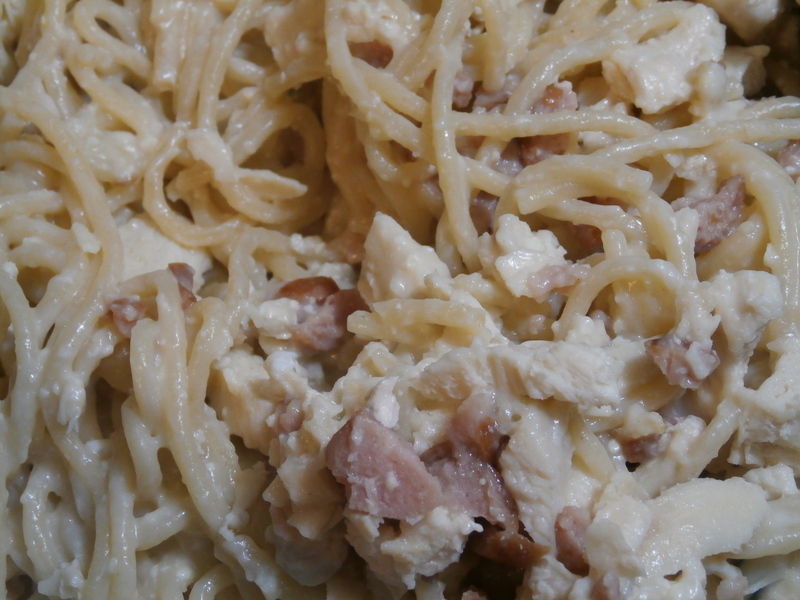 Traditional Carbonara doesn’t use any kind of cream base sauce, however, I find that whipping up a quick white sauce- made from flour, butter, and milk to be super easy and healthier than the typical cream cheese or other cream based sauces used in Chicken Alfredo or restaurant Carbonaras. I used to make this simple sauce when we were students, not only is it far healthier than using heavy cream or cream cheese, its also more cost efficient. It’s so rustic, and one usually always has on hand flour, milk, and butter – making it a quick solution without an extra run to the store. 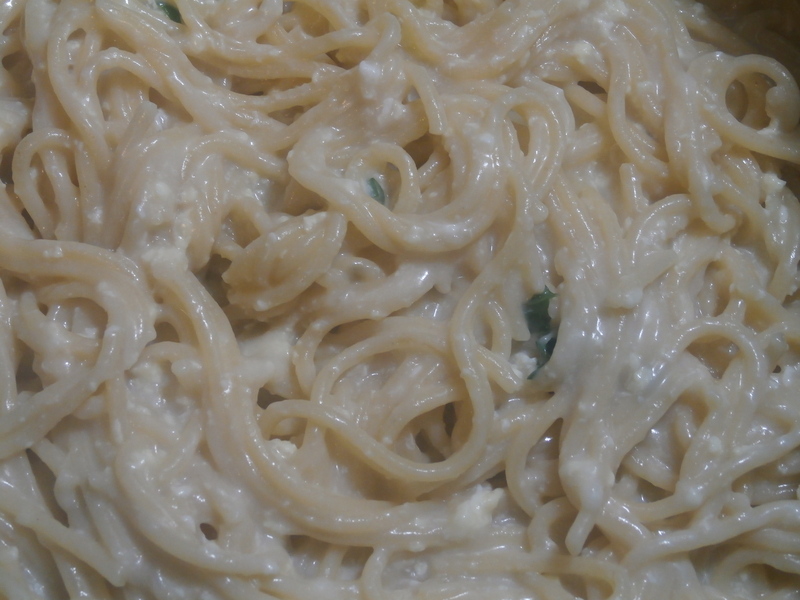 Boil a package (1 lb) of spaghetti, while waiting for it to cook, make the simple white sauce if you want a creamier base for your Spaghetti Carbonara without the extra calories of real cream or cream cheese. 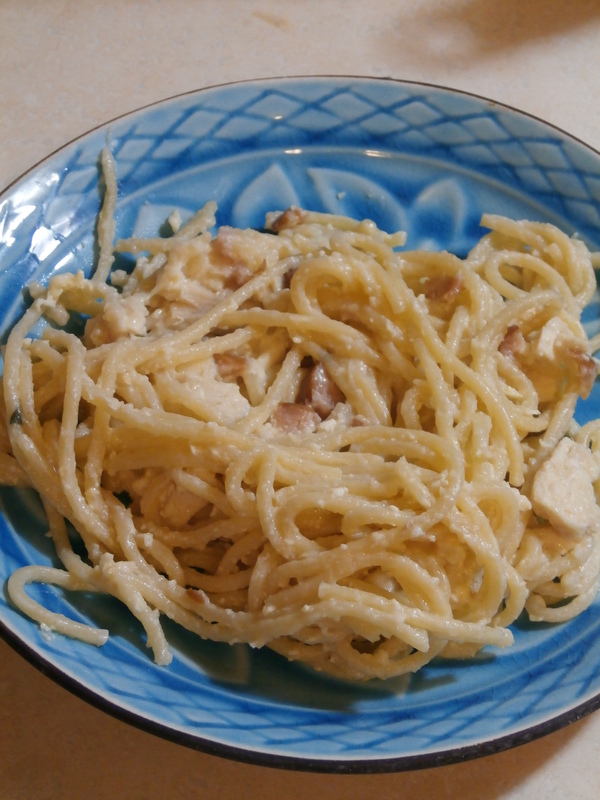 Traditional Spaghetti Carbonara has no cream sauce, if you desire to cook it that way, skip to egg picture. Use 3/4 stick butter, or half a cup of margarine, in a pan on medium heat – melt down until in liquid form. Add 1/2 cup flour, mix together to form a wet, clumpy mixture. Take OFF heat. Add in 1 cup cold milk, and 1 1/2 cups cold water, put back on heat and whisk the mixture until its incorporated into the milk and water to form a smooth, white cream. Let cook on heat for 5 minutes, slowly stirring every now and then, sauce will thicken nicely. I used fresh basil and oregano from our garden, along with some fine garlic to give the sauce flavor. Add in 1 tsp of kosher salt along with crushed black pepper (1 tsp or to taste). Use 2 eggs (or 4 if you’re omitting the white sauce), beat until pale yellow. Once spaghetti is cooked, pour eggs over drained, hot spaghetti, stirring quickly. The heat from the spaghetti cooks the eggs and creates a unique texture over the noodles. Incorporate as much freshly grated Parmesan cheese as you’d like (typically 1/2 a cup to 1 cup). This is what it looks like with just the eggs cooked onto the hot noodles (below). This is what it looks like when the cream is poured over the egg and cheese mixture (below). We like it to be creamier this way. I briefly cooked (reheated) the meats in the pan and then added them into the spaghetti. This would be a great time to add in chopped onions, mushrooms, chives or extras you’d like in your dish! So there you have it… a healthier version of Spaghetti Carbonara, loaded with chicken, beef sausage, and creamy white sauce based on pantry or fridge leftovers. 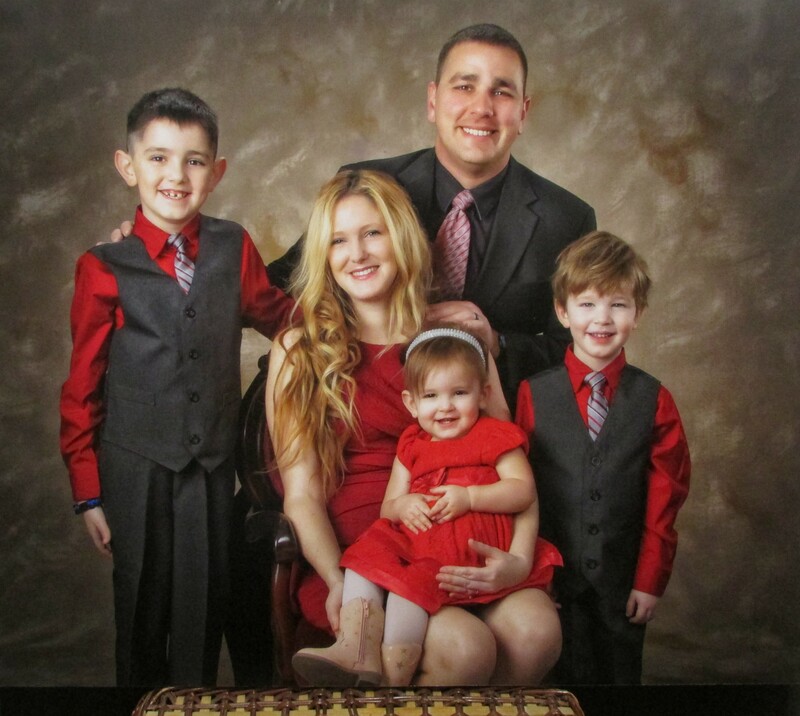 From Johnney’s version – not as traditional, but a great alternative and presented in such a manly way….